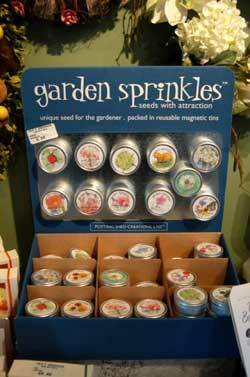 Garden Sprinkles are perfect for any level of gardener. From the novice to the advanced anybody would love these cute little boxes. The round tins have a magnet on the back enabling you to place it on the fridge orany other metal surface. Each box closes tightl y so your seeds stay dry and safe. The larger boxes are unique seed collections of Culinary Herb Garden, Bird, Bee & Butterfly Garden, and French Garden. Each tin contains marker stakes, seeds, each packed in individual tins and a planting book. Each package will bring joyous entertainment to your landscape of container. Bamboo Spoons are all the rage in the kitchen. These durable spoons are made of the quick growing renewable resource of bamboo. 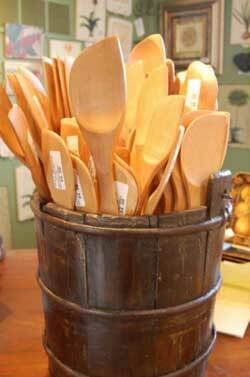 Wooden spoons also get tired looking compared to these spoons that last years and never wear out. The pointed edge of each gets into the saucepan corners and does not let your cooking burn. They come several different lengths and styles and we are sure you will buy the all once you have tried one. Worlds #1 Pot Scrubbers are very handy about the kitchen. 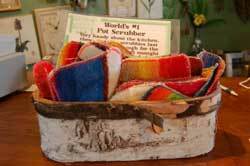 These handy scrubbers’ last and last. They are tough enough get out the hardest baked on grim, but gentle enough to not scratch glass and counter tops. Throw in the dishwasher to clean. Bee Glass is one of our most popular items in the gift shop. This durable glass is made in France and is embossed with the Napoleonic Bee. 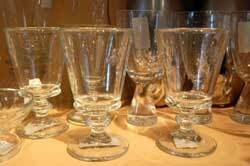 We carry tumblers, plates, wine goblets, candleholders, bowls and many other items in this line. If you cannot find what you are looking for ask when the next shipment is arriving as it is so popular we are able to get you what you require. 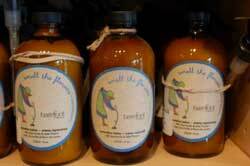 Smell the Flowers Hand Cream is made by Barefoot Venus, however this hand cream is way too nice to put on your feet. The gentle smell of warm earth blended with spring flowers is the best way to describe this product. A must have for the tired hands of a busy person.